Good Things are one of my FAVOURITE drugstore brands, especially for young skin. Their products are pretty gentle, packed with superfruits, free from nasties like parabens, mineral oils, SLS and they’re suitable for veggies. For me, Good Things couldn’t get much better. Then they released a Manuka Honey line. Long term readers of WhatLauraLoves will know that I’m a sucker for Manuka Honey as it is one of my favourite ingredients in skincare. The line with Good Things was designed specifically to help to keep the skin looking clear and feeling hydrated whist tackling the problems that can lead to the skin ageing. At 25, I’m starting to notice the strain that my hectic life has on my skin so I am all for products that are going to help me look a little less than half way to 50! 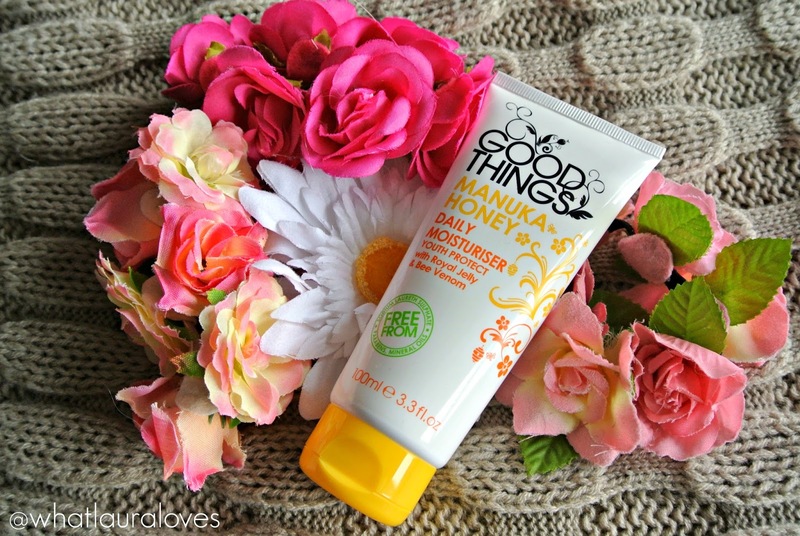 The product that I’ve been using from the line is the Good Things Manuka Honey Daily Moisturiser which has been in my skincare rotation for the last couple of months. I’ve been enjoying it firstly because it smells incredible. If you love the smell of honey then you’ll love the smell of this moisturiser but I guess there’s no surprise there. The Manuka Honey Daily Moisturiser has a youth protecting, skin softening formula that you can really feel is doing your skin some good. The moisturiser has a gorgeous consistency; I wouldn’t say that it was light weight but definitely not thick. I find it a little too heavy for my super oily skin to use before make up application but if I’m not wearing make up that day then I’ll slick a bit of this on to complete my morning skincare routine, if I am wearing make up, I’ll simply use it as my evening moisturiser which works really well as I love waking up to super smooth and soft skin. When I first felt the consistency of the cream, I thought it might break me out a little as it felt like it would sit on my skin and perhaps block my pores. I’m happy to say that it doesn’t block my pores at all and I haven’t broken out once using it which may also be due to the propolis and Manuka honey that it contains which are known to have an antibacterial effect on the skin. The moisturiser does sit on the skin a little, which would make it fabulous for those with dry skin. For my super oily skin, I simply apply it and then ten minutes later, I pat my skin again to make sure that it is all full absorbed into my skin. 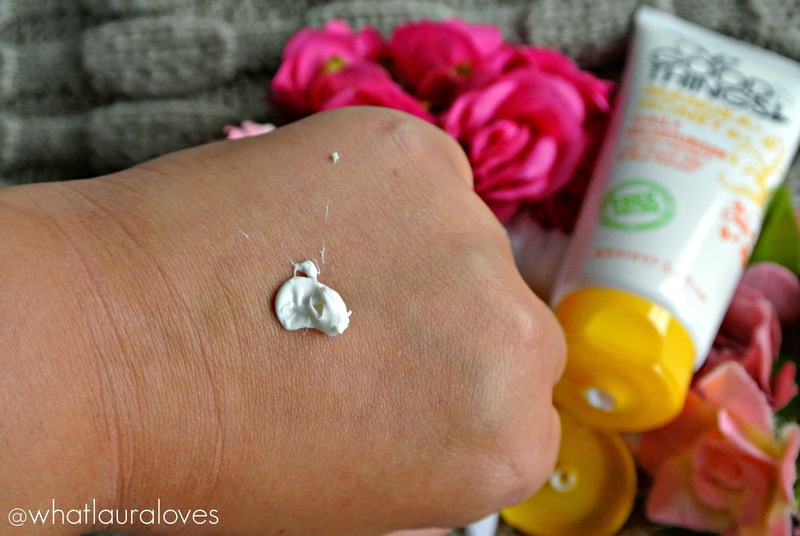 I would definitely recommend it to those with normal to dry skin as I’ve found that I’ve liked using it even more after coming back from my honeymoon where my skin has been sun-drenched and therefore a little drier. As soon as I apply it, I can feel it nourishing and moisturising my skin and I guess I have the royal jelly and beeswax listed within the ingredients to thank for that as they’re known to be super duper skin moisturisers. Another ingredient that helps to nourish the skin is Echinacea extract which also promotes the longevity of the skin and helps it to look renewed. Apart from making my skin feel ridiculously soft, I also found that my skin looked plump, youthful and full of life. It was only when I was looking further into this product (researching it, not looking in the tube…) that I discovered that it contains bee venom. Now you should know by now that I am a BIG FAN of this wonder ingredient as it helps to boost collagen levels in the skin, making it look plump and youthful. For a 100ml tube, this moisturiser retails for £7.99 which is superb value for money. There’s even an offer on at the time of writing on the link below. I would most definitely recommend this moisturiser and I can’t wait to check out the rest of the line when I’m next in store. 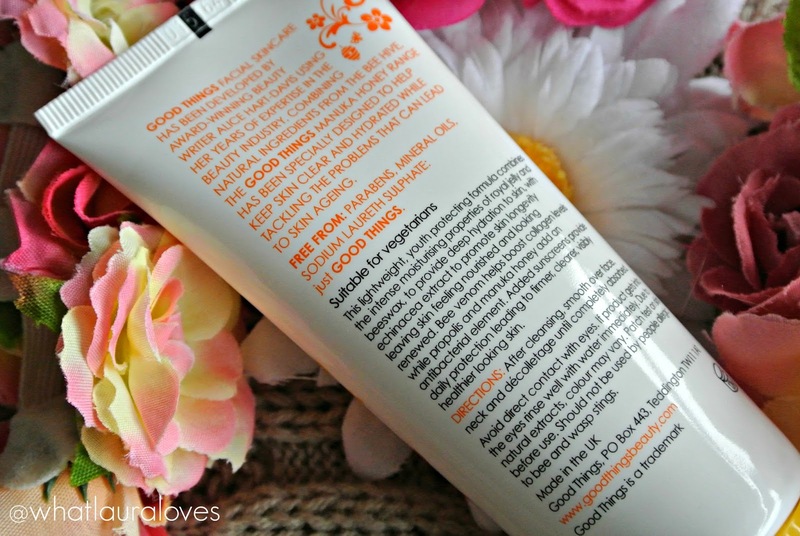 Good Things have their own website which you can have a look at here and you can buy this moisturiser and other products from their range here.